On March 5, 1940, thirty-three members of the Odessa Chamber of Commerce got together to come up with a way to show the world how special Odessa, Tx was. 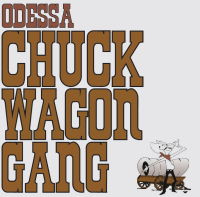 This Odessan think tank, full of prominent local businessmen, landed on a lasting solution that day in the form of the Odessa Chuck Wagon Gang. It’s easy enough to throw some steak on the grill and beans in the pot, but the men wanted a Chuck Wagon catered event to be more than that; they wanted it to be an experience that people would remember. To find this experience, the men looked to the past at the traveling chuck wagons. Chuck wagons and their cooks traveled the cow trails across Texas with a distinct style of cooking that people of all sorts enjoyed. 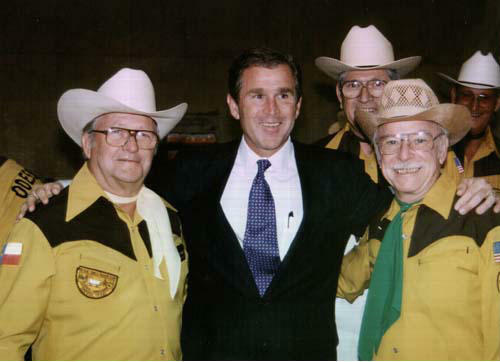 Looking to these cowboy chefs, the founders had a theme that would honor the history of Texas while adding to it. The Odessa Chuck Wagon Gang has traveled both smooth and bumpy trails. We have survived wars, meat rationing, floods, and sandstorms. We’ve stood before presidents and Odessans alike, always with a tasty plate of food, a friendly smile, and a kind word about Odessa. We have dared to be unique, dared to cling to an idea that couldn’t have succeeded without tiring hours of hard work, millions of miles of travel, and a belief in Odessa and Texas. As sure as the beauty of an Odessa sunset, the Odessa Chuck Wagon Gang will be crisscrossing the highways and airways of this nation and the world, always ready to serve.